An industrial robot is an automatically controlled, multipurpose manipulator programmable in three or more axes that is generally designed to move materials, parts and tools, and perform a variety of programmed tasks in manufacturing and production settings. They are often used to perform duties that are dangerous or unsuitable for human workers. Ideal for situations that require high output and no errors, the industrial robot is becoming a common fixture in factories. Cartesian robots (also called linear robots) whose three principal axis of control are linear and are at right angles to each other. Scara (Selective Compliant Assembly Robot Arm) robots are based on a 4-axis design and have a full range of motion on its X and Y axis but is unable to move in the Y axis. Articulated Arm robots feature rotary joints and commonly have four or six axes. Each joint is called an axis and provides an additional degree of freedom, or range of motion. Delta (or Spider) robots are built from jointed parallelograms connected to a common base. The parallelograms move a single end of arm tool (EOAT) in a dome-shaped work area and is capable of delicate, precise movement. 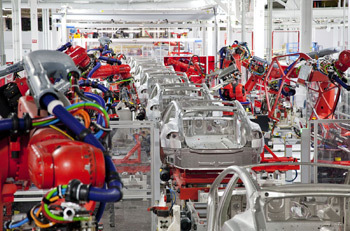 Collaborative robots can collaborate with human co-workers. Safety features that prevent human harm are designed and built into the robot itself. Collaborative robots can often be manually “taught” instead of programmed by an operator.